Last night’s Biggest Loser Finale was AMAZING! How great did Amy and Phil look?! Heba and Ed looked amazing too, but I could not get over Amy and Phil. They were little rails. For those of you who didn’t watch yet, I won’t ruin it, but Michelle looked great and she was my favorite all season! Her pink dress was too cute, and her attitude about everything was amazing. Vicki looked like Vicki, mean and scheming. I was never a big fan of her and her devious ways. Ed looked great and it seems like him and Heba will keep up on the exercise and hard work too. I was kind of shocked that such a huge number of votes that wanted Ed to go up against the girls. Oh well, congrats to the winner and everyone on the show for looking so amazing at the finale. Tonight I’m back at it at Amp’d Abs which I’m really excited about. If you are thinking about taking a class, I would totally recommend them at a local gym or a 24 hour fitness if you are willing to look like an idiot in front of other people. At first taking the class was kind of awkward, but once you get past the fact that everyone else is looking just as dumb as you are, it’s fun and I feel like it has definitely strengthened and toned and has taught me new moves to do outside of the gym as well. After the class I’ll be on the good old 20 treadmill-20 bike-15 elliptical-5 stair stepper program. I feel really good after I work out that hard at the gym. Today’s gift of the day is all about blisters. Those little nagging things you get when you run to far and think, oh it’s just a little pain, or it will go away, then you take off your shoe and a huge bump of, okay, okay that’s enough! Here’s what will help you get through the long runs or even if you are just starting out with running. I used to live by 2nd skin and mole skin back in the high school racing days. For all types of blisters, we have the Spenco Blister Kit sold on American RX that can be found here for $6.20! It features Spenco 2nd Skin (which I’m super partial too) and foam pads to soothe, cool and protect against rubbing, hot spots, and blisters. It includes 6 moist pads @ 1″ square each in a resealable bag, along with 1 adhesive sheet (3″x5″), 6 adhesive strips (3″x1.5″) and 11 foam pressure pads. Mountain gear also has a before and after Blister Kit for $18.95 that can be found on their site here. This kit claims to prevent blisters from forming or eliminating the discomfort of them. 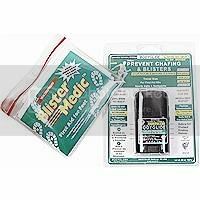 This kit includes a Blister Medic first aid kit from Adventure Medical Kits and two Body glide sticks. 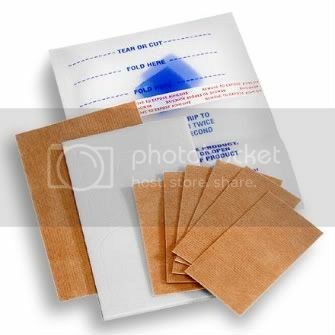 The first aid kit includes 2 strip adhesive bandages, 2 knuckle adhesive bandages, 3 antiseptic towelettes, 2 Moleskins, Spenco 2nd Skin, Molefoam, Non-woven adhesive knit, scissors and 2 double antibiotic ointments. There are also 2 0.45 ounce Body glide sticks to help prevent chafing and blisters. 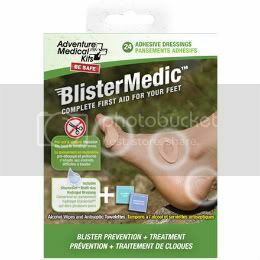 Backcountry.com has some options as well that includes the Adventure Medical Blister Kit for $7.99. The option includes GlacierGel, Moleskin, antiseptic towelettes, and alcohol wipes to give you complete first aid for a hiker’s feet. Including 15 dressing and 15 wipes. Lastly, I found the blister kit mecca on Zombie Runner. They have a foot care section that would battle Dr. Scholls laboratory. First off they have the Pocket Foot Care Kit. It’s designed for blister repair on the run. It’s small enough to fit in your pocket. Includes blister patches and other essential items, plus instructions for use. Find it here for $7.95. It includes: Benzoin ampules (2) Alcohol preps (6) Antibiotic ointment (2) Spenco Blister Pads (2) Blist-O-Ban Blister Pad (1) Sterile lancets (2) 3″ x 5″ baggies (2) BlisterShield Powder, packet (1) Engo Performance Patch (2) Trail Tissues (1) Instructions. Secondly you can find the Small Foot Care Kit here for $ 19.95. It includes all this : Benzoin ampules (4) Alcohol preps (8) Antibiotic ointment (4) 2″ Elastikon tape (1) 1″ Micropore tape (1) Spenco 2nd Skin (2) Folding scissors (1) Powder 2″ x 3″ baggies (2) 3″ x 5″ baggies (4) Instructions. Seriously talk about a ton of stuff! You can also check out these great products they have on their site. Their site was a wonderful location for many foot care items so make sure you check them out if you are in the market for foot repair!